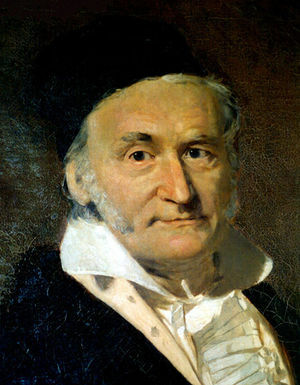 Carl Friedrich Gauss (1777–1855) was a German mathematician considered to be one of the greatest of all time, sometimes called the "the prince of mathematicians." He had an enormous impact on many areas of mathematics, including number theory, analysis, geometry, electromagnetism, astronomy and optics. Gauss strongly believed in the existence of God, and he also supported monarchy and opposed Napoleon, whom he saw as an outgrowth of the revolution. Gauss was a child prodigy. He could calculate complicated mathematical problems from an early age. He claimed that he knew how to count before he knew how to talk. According to legend before he was in elementary school he once corrected an error of calculation in his father's finances. He calculated a complicated mathematical problem his third grade teacher gave his class within a few seconds. The problem was to calculate the sum of the first 100 natural numbers. Gauss spotted immediately that by adding 1 + 100 (=101), then 2 + 99 (=101), then 3 + 98 (=101), he would end up with 50 lots of 101, which is 5050. The method that Gauss applied to this problem can be applied to all arithmetic progressions. After this and other feats his teacher recognized Gauss's genius and sought to get him in high level academic math. By age 12, Gauss was questioning the axioms of Euclid. By age 19 Gauss had proven that the regular n-gon was constructible if and only if n is the product of different odd prime Fermat numbers and a power of two. When he was 24, Gauss published Disquisitiones Arithmeticae, considered perhaps the greatest book of pure mathematics ever. He improved the understanding of complex numbers. Gauss was the first mathematician to prove the Fundamental theorem of algebra and the Fundamental Theorem of Arithmetic. Gauss also collaborated with physicist Wilhelm Weber who helped discover magnetism and define it in terms of mass, length and time. Gauss influenced a Russian mathematician named Nikolai I. Lobachevsky (1792-1856). Lobachevsky invented non-Euclidean geometry and used some of Gauss's ideas to develop it. The gauss, a unit of magnetic flux density, is named in his honor. It is not a formal part of the SI (metric system), although it is still widely used. The proper SI unit is the tesla. One tesla = 104 gauss. After his death his brain was preserved and studied by a German physiologist and anatomist named Rudolf Wagner to see if a neurological explanation for Gauss's genius could be found. He found that Gauss's brain weighed 1,492 grams and that the cerebral area of Gauss's brain was 219,588 square centimeters. He also found that there were abnormal highly developed convolutions in his brain. This page was last modified on 26 July 2018, at 11:33.